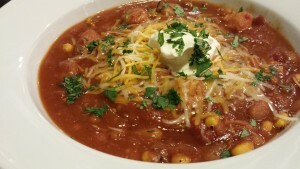 Red Chicken Chili with Beer. It’s been a fairly mild winter here in the Washington, DC area. The week of Christmas was met with mild 70 degree temperatures. We may have had one hard freeze so far. Now, after New Year’s Day, we are starting to see some “normal” cold weather for this area. 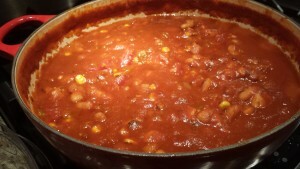 Some snow flurries are expected today just in time to make a batch of simmering chili on the stove or in a Crock Pot . 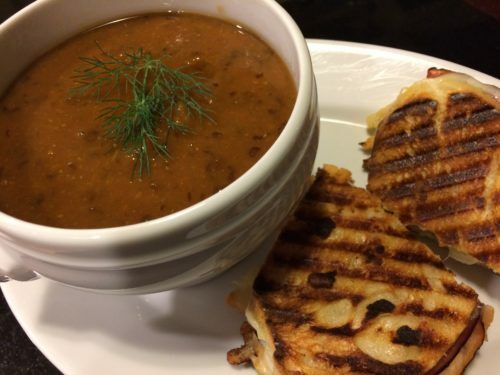 My Red Chicken Chili with Beer can also help you celebrate at your Super Bowl Party, too. 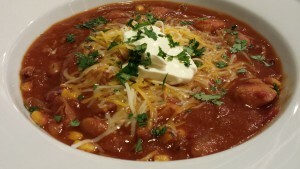 Most chili recipes highlight beef as their main ingredient. 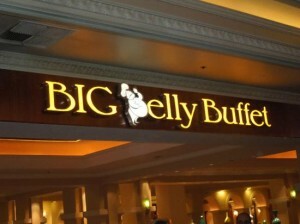 In lightening up my menus, I’m eating more poultry and fish. I’ve added chicken to this chili instead of beef. Beans are a fantastic way to add protein to a recipe and I’m using white cannellini beans here. I like to add spices to my chili such as cumin, Mexican oregano, and chili powder. 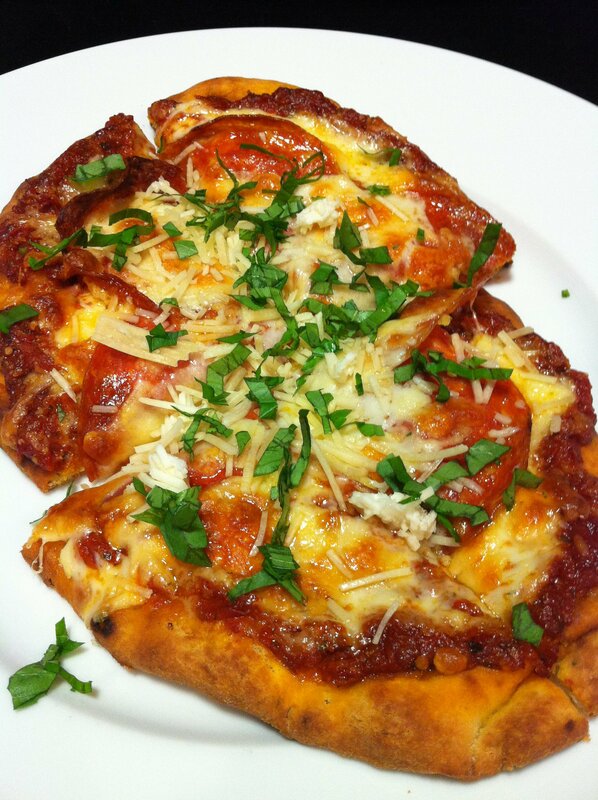 Yes, you should use the Mexican oregano in this recipe because it has such a unique taste. McCormick Mexican Oregano is available in the spice section at your local grocery store as well as online at Amazon.com . 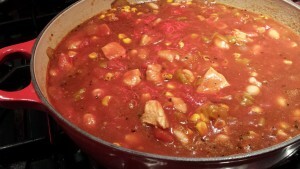 Of course, garlic, tomato sauce, diced tomatoes, chicken stock/broth and my favorite roasted corn round out the ingredient list. And for additional flair and flavor: Guinness beer! 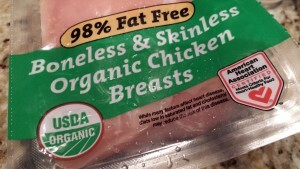 Start with two boneless skinless chicken breasts. 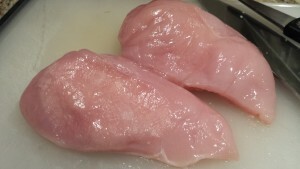 Remove the chicken breasts from the packaging and trim off any extra fat that is remaining. 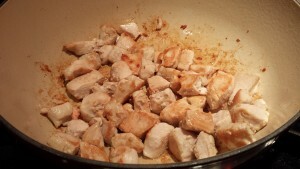 Dice the chicken breasts into 1 inch cubes. 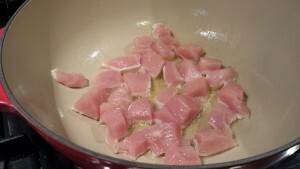 Saute the chicken cubes in olive oil. Turn the chicken cubes until they are browned on all sides. 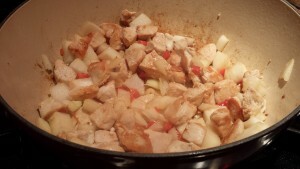 Add some diced onion and diced red bell pepper to the chicken cubes. Saute until the onion and pepper are soft and slightly browned. Add the garlic and saute a few minutes. 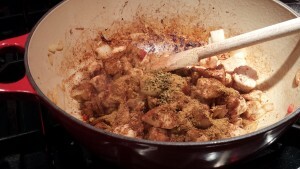 Add the spices to the chicken mixture. Stir and saute for a minute to open up the spice flavors. Add the beer, stirring to scrape up the brown bits that have formed in the pan. Let the mixture cook a minute or two to burn off the alcohol from the beer. 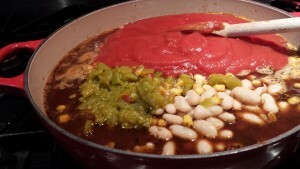 Add the green chiles, roasted corn, white cannellini beans, diced tomatoes, and chicken stock. 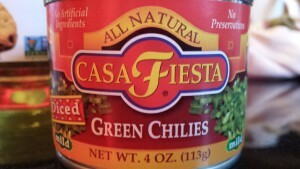 I like to use Casa Fiesta Diced Green Chilies . Add the tomato sauce. And stir the chili until it is well mixed. 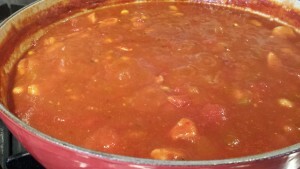 Simmer the chili over low heat, covered, for at least an hour, stirring once in a while so the bottom doesn’t burn. Serve this chili along with shredded cheeses, sour cream, and chopped cilantro. 1. 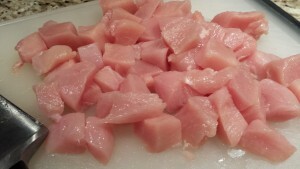 Cut the chicken breasts into one inch cubes. 2. Warm the olive oil in an 8-quart stock pot over medium heat. 3. 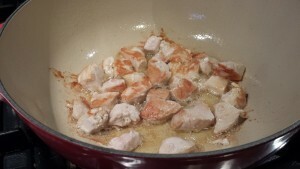 Saute the chicken cubes in the olive oil until browned on all sides. 4. Add the onion and red bell pepper and saute until slightly browned. 5. Add the garlic and cook two minutes, stirring so the garlic doesn’t burn or overbrown. 6. 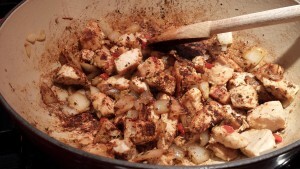 Add the Mexican oregano, chili powder, cumin and stir. Cook for two more minutes to let the spices open up a bit. 7. 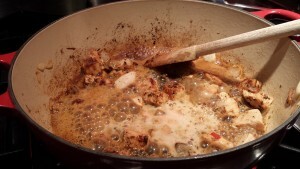 Add the beer and stir the chicken mixture to loosen up the brown bits on the bottom of the pan. Simmer a minute or two to let the alcohol burn off. 8. 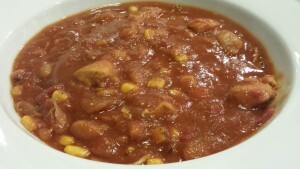 Add the corn, cannellini beans, green chiles, diced tomatoes and chicken broth/stock to the stockpot. 9. Add the tomato sauce and stir well to combine. 10. Simmer for 30 minutes, covered, stirring occasionally, until the chili has thickened slightly. 11. Ladle chili into serving bowls, garnish with cheeses, sour cream, cilantro (or parsley), and serve! Serves 2 – 4 as a main course. For a five-way chili mac, serve over spaghetti pasta, and this recipe will serve 6 people. 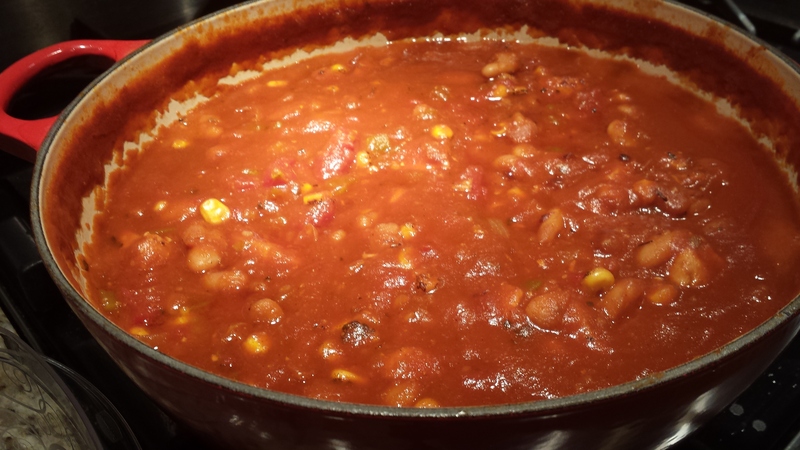 This chili freezes well so make a big batch and save some for a future meal. 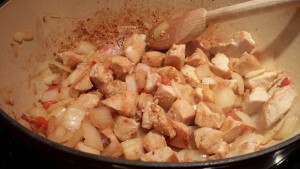 Variations: Instead of chicken, you can use diced cooked turkey breast or ground turkey. Try ground chicken or turkey for a different texture. Add kidney beans or black beans. Add some cubed zucchini squash. 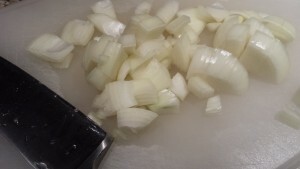 Top with sliced scallions or diced onions in addition to the other toppings. 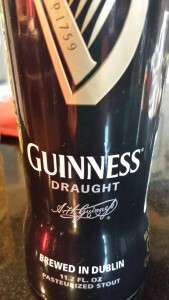 Try a different dark beer instead of Guinness or omit the beer all together.